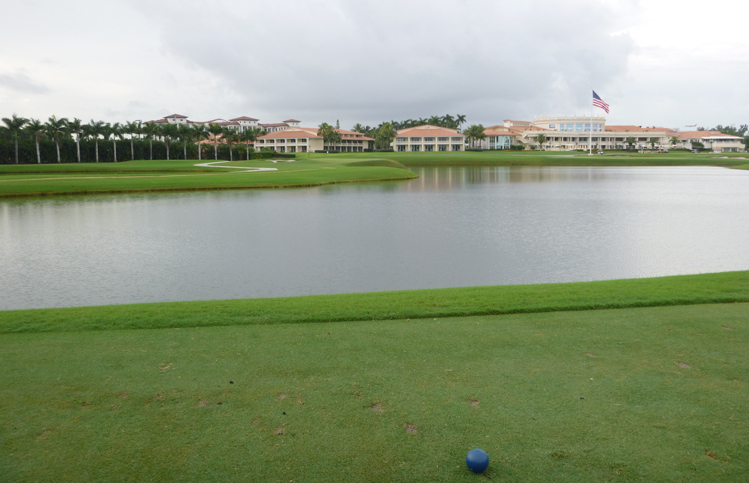 Trump Doral (Blue Monster) Hole 3: This par four isn't overwhelmingly long, but the tee shot has to fly the water and stay left of it when it lands. However, too far left brings in bunkers as well. The second shot is also daunting with the water guarding the green, so the ideal tee shot will be hit relatively far and cut the corner. Put another way, if you want less stress on the second shot, you have to create a little more off the tee. 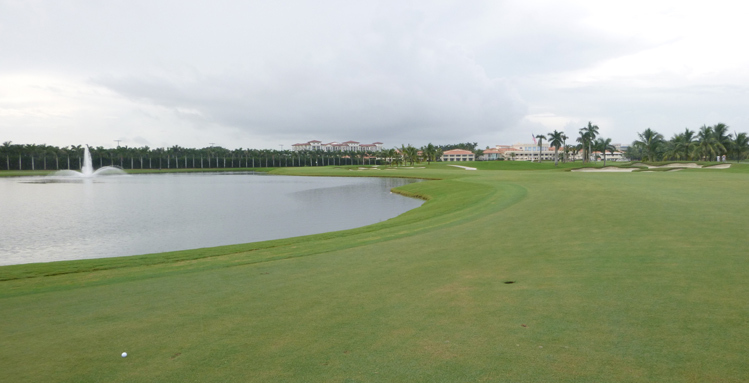 Trump Doral (Blue Monster) Hole 4: The first par three of the day offers a taste of things to come as it features a green that has steep banks and water short, right and behind. The green then hunches over that water with two sand traps lurking just left of the surface. It also is fairly long with limited bail out options, making ball striking key. 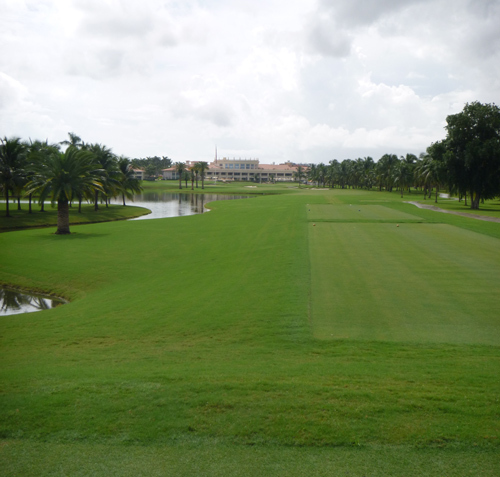 Trump Doral (Blue Monster) Hole 7: This par four is straight and long. 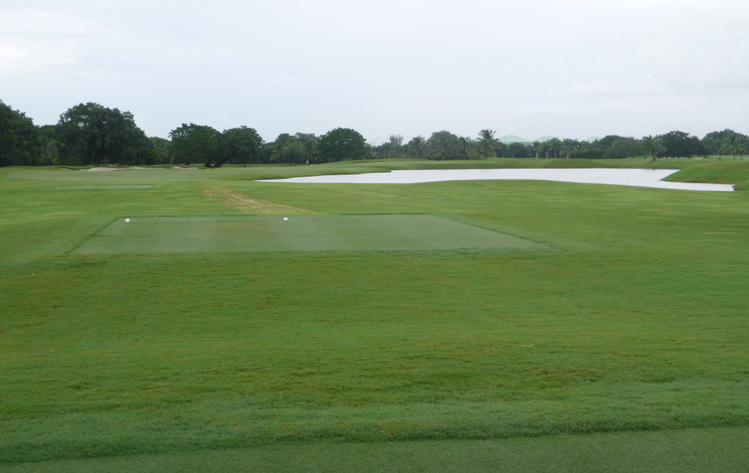 The tee shot, although there is water to the right, is fairly wide open. The second shot, however, certainly has to deal with the water right of the green and a bunker to the left. The green also has some break to it, which adds to the challenge. Trump Doral (Blue Monster) Hole 8: This par five is the only truly reachable one on the course (unless the golfer is a beast). However, there is water in play on the left from tee to green and that green is sandwiched between the water and some deep bunkers. Played as two or three shots, accuracy is key. 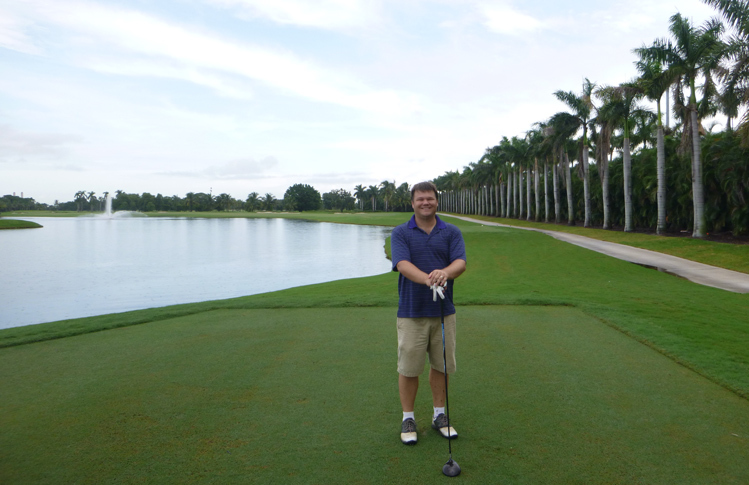 Trump Doral (Blue Monster) Hole 9: A terrifying tee shot awaits the golfer to close the front nine. This par three is over water and the green is on a tiny piece of land with water wrapping around most of it. Even the bailout short left is fraught with danger as too far left brings in a separate lake and a nasty bunker is waiting just left of the green as well, which is a scary up and down with water behind that shot in any direction. 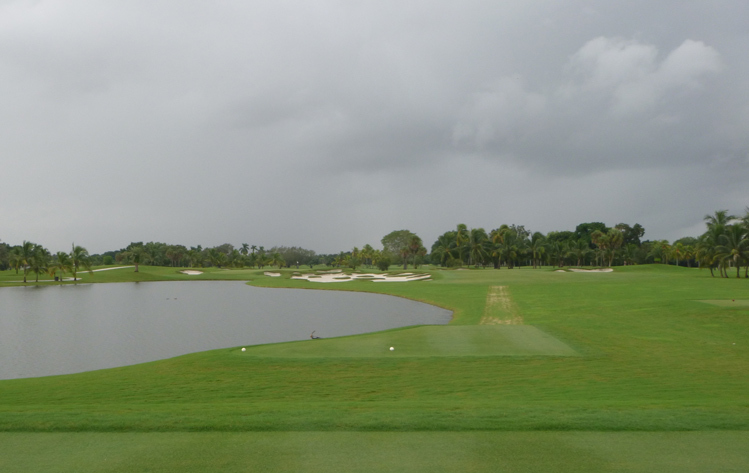 Trump Doral (Blue Monster) Hole 10: Yet another tough tee shot faces the golfer at the beginning of the back nine. The water can be cleared, but the questions how much can be cleared. Staying right of it also brings into play the row of palm trees that signal the out of bounds markers. If the golfer can find the right angle and stay in play and dry, the rest of the par five requires shots that, once again, must stay right of the water and left of bunkers that are always near where the ball is to land. The green also has a swale and heavy undulations. Trump Doral (Blue Monster) Hole 11: The eleventh is a bit of a departure, as it is short, has no water and requires a lot of strategy and gives a lot of options off the tee. There is a huge bunker in the fairway that the golfer can stay short of, go left of or fly the right side of and still be in the fairway. There are more bunkers guarding the green, but thoughtful routing can make this into a good scoring opportunity. Trump Doral (Blue Monster) Hole 12: This par five is really straight and the golfer really just needs to avoid the bunkers throughout and OB to the right. It has the most alluring bunker designing on the course. 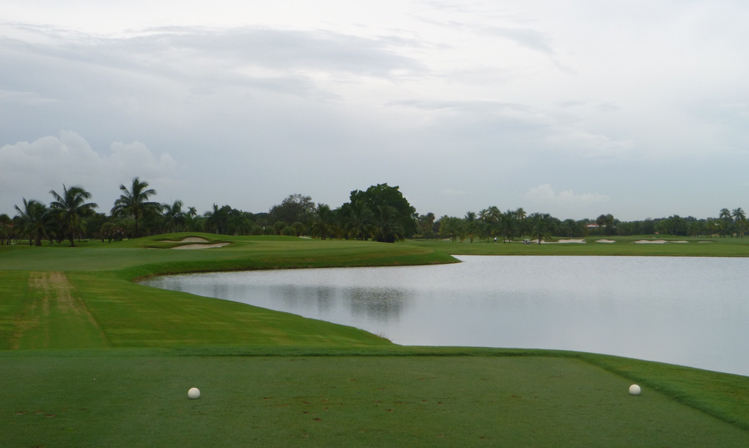 Trump Doral (Blue Monster) Hole 15: It isn't very often that a hole nearly surrounded by water is known as a breather, but as tough as the Blue Monster is, this short par three qualifies as such. If the golfer can avoid the water and find the right section of green, this is actually a relatively strong birdie chance. Trump Doral (Blue Monster) Hole 16: This short par four underwent major surgery from it's former self and now is quite a sight. The tee shot is beautiful over the water and wall of imposing bunkers. However, being so short, a lay-up is a great option and only mid to short irons are required. Of course, the big dogs can try to bite off a big chunk and go for the green or leave a pitch, but let the biter beware. 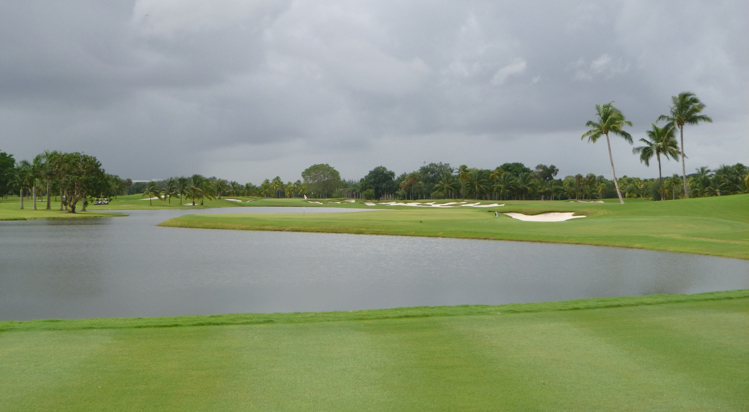 Trump Doral (Blue Monster) Hole 18: The final hole is one of the most famous in America and also one of the toughest. It has brought many a professional golfer to his knees, which is generally known when you step on the tee box. The water is clearly in view as is the "forest" of short palm trees to the right. Placing the ball in the ribbon of fairway is tough, but crucial to avoid bogey at absolute best. From there, the second shot is again over the water with a steep bank short and left, and again, welcoming bunkers to the right, leaving a downhill chip or sand blast towards the water with the green running away. More Florida Golf Course Reviews.